As I walk through the magical Chinese Gate and into the gallery of the bright red lanterns, my holiday triggered mild Seasonal Affective Disorder afflicted mind calms down. 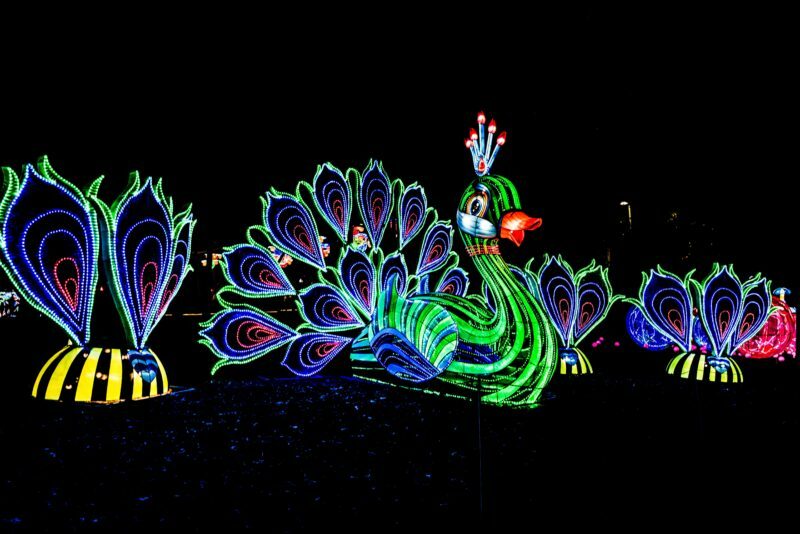 I walk through the numerous LED Lantern displays exhibiting the exquisite work of the Chinese artisans presenting a miniscule piece of the Chinese culture and mythology. No, I am not in China. 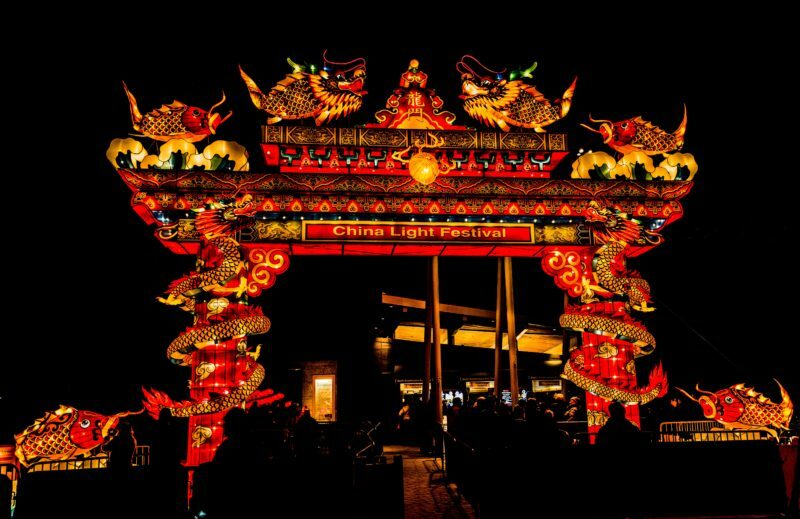 I am in the city of Cary in North Carolina, which is part of the Research Triangle Park, the area which showcases the diversity of USA celebrating the Chinese Lantern Festival. Mythical Chinese Gate – In ancient China, this magical gate was on the bank of yellow river. The carps jumping through this gate moved up the animal cycle and became a dragon. I recollect the legend I read while viewing one of the displays – Once upon a time, some Chinese villagers killed a swan which traversed the heaven and the earth. The swan being a favorite of the Jade emperor the heaven. This angered the Jade emperor who wanted to destroy the village on the 15th day of the first Chinese lunar month in a storm of fire. A fairy who came to know of his plan for vengeance warned the villagers of the imminent destruction and advised them to light up red lanterns on the chosen day, so it would appear as though the village is ablaze. The people did so. The Jade emperor who descended from the heaven on the designated day, saw the village was already ablaze as the red lanterns in the village appeared as a massive fire. Satisfied he returned to the heaven. Thus started the tradition of the Lantern festival. 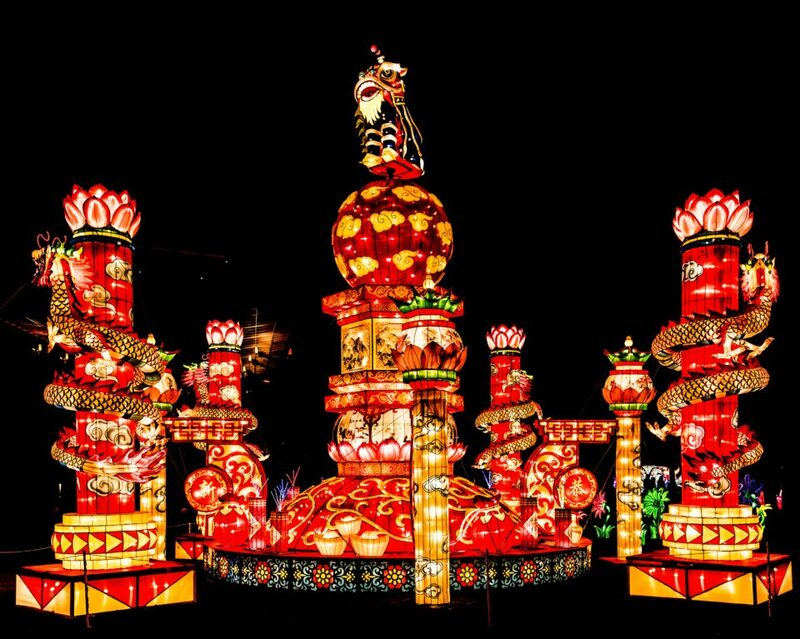 The Chinese Lantern Festival is celebrated on the 15th day of the first lunar month. 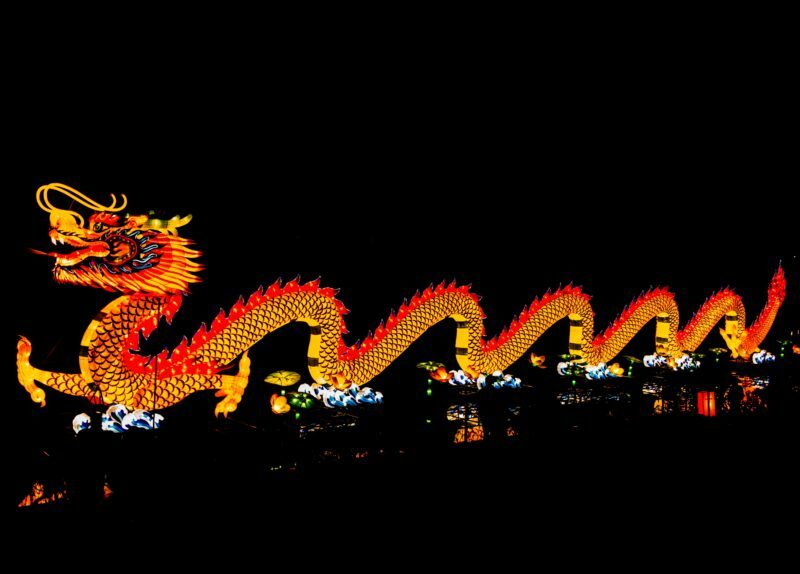 The first month of the Chinese Lunar calendar coincides roughly between January and March. Peacock are known for their extravagant feathers which they display during the courtship ritual. In Chinese culture, peacock is a symbol of kindness, intelligence and beauty. The festival for all practical purposes started during the Western Han dynasty period between 206 BCE and 25 CE. It is celebrated as the Chinese equivalent of Valentines’ day in Hong Kong and Taiwan. In ancient times, the youngsters were chaperoned around in the hope of finding a match as the bright red lanterns bring in good luck and hope. The festival signifies the end of the Chinese New Year Celebrations. 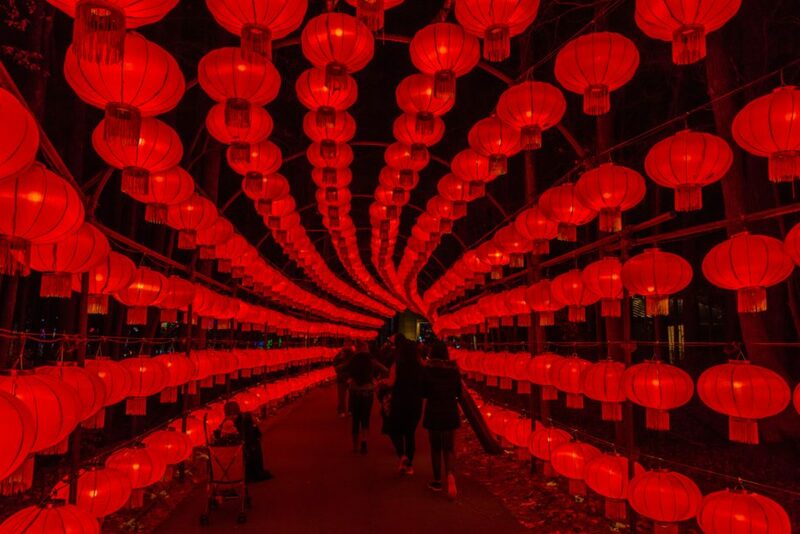 Lantern Gallery – Bright Red Lanterns symbolize happiness and goodluck and create a festive atmosphere. Azure Dragon – legendary animal coming from Chinese mythology. Chinese God of Wealth – He brings in fortune and wealth to the Chinese people. 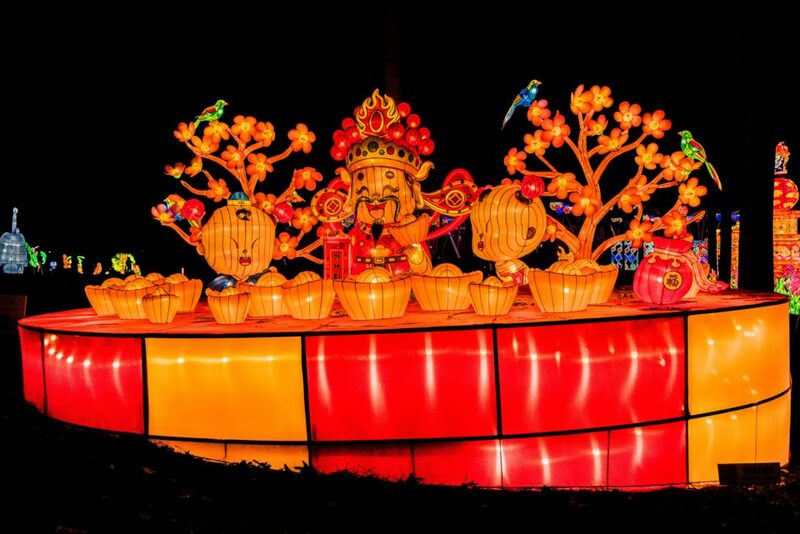 I had the opportunity to visit the Chinese Lantern Festival being celebrated in the City of Cary in North Carolina between November 24th 2017 and Jan 14th 2018. The venue is the Booth Amphitheater in the City of Cary. The venue is open between 6 pm and 10 pm everyday except Mondays. There are about 25 displays with more than 15000 LEDs. 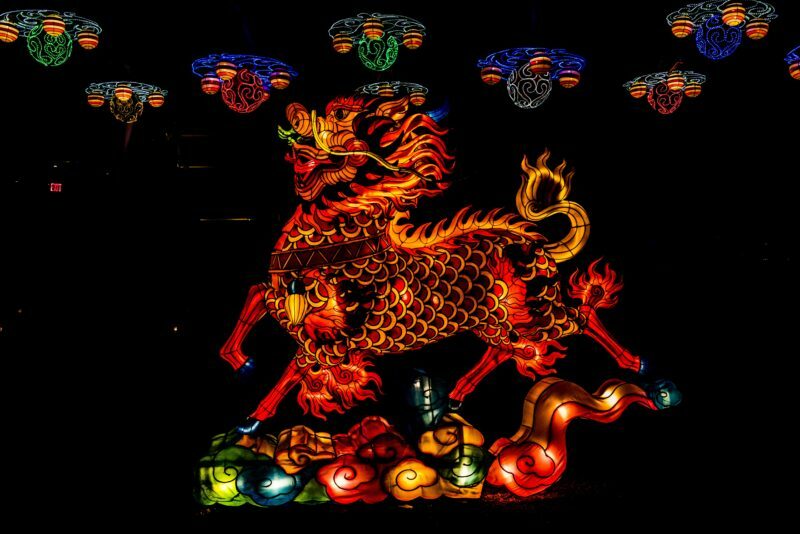 The lanterns were shipped from Zigong in Sichuan province in China, which is the Lantern capital of China and assembled by the Chinese Artisans in the month of November. These lanterns are made of silk fabric supported by steel frames and lit by LED lights. The striking piece is the dragon which weighs about 18000 pounds and is about 200 feet in length. There are food stands which sell snacks and beverages. And there are Chinese acrobatics and culture performance which takes places 3 times in the evening. It takes about 75 minutes to experience the displays. Overall it provides a perfect family outing for the evening. Do note there is an entrance fee of $15 for adults and $10 for kids. The venue is stroller and handicap friendly. Apart from Cary, Indianapolis, Columbus and Little Rock celebrate the lantern festivals in USA.